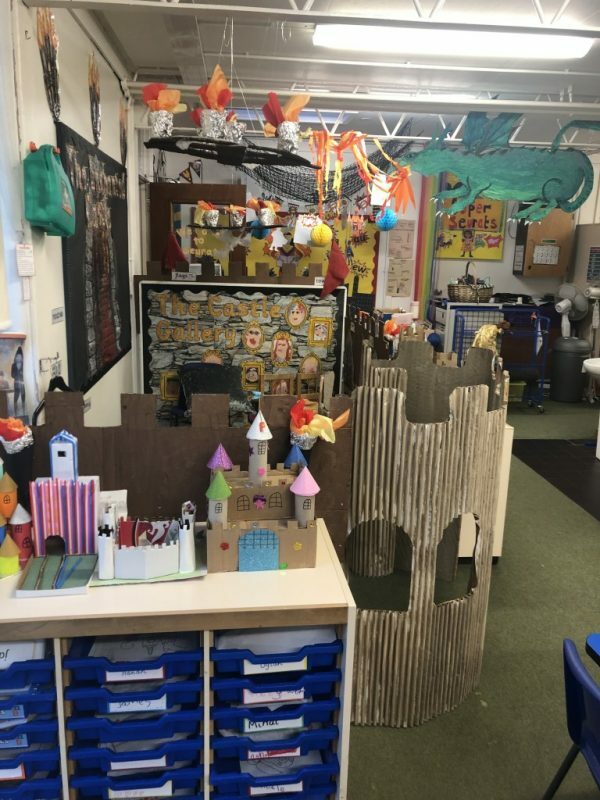 In Literacy, we begin our topic by looking at lots of poetry focusing on vocabulary relating to castles. We will use this vocabulary to create descriptive poetry pieces in preparation for our writing through the term. The children will be encouraged to explore new and unfamiliar vocabulary and find out what it means. Following poetry, we will be exploring traditional tales. We will be looking at two key narrative texts, ‘The Sword in the Stone’ and ‘Beauty and the Beast’. Finally, the children will apply non-fiction skills to report and write information texts. 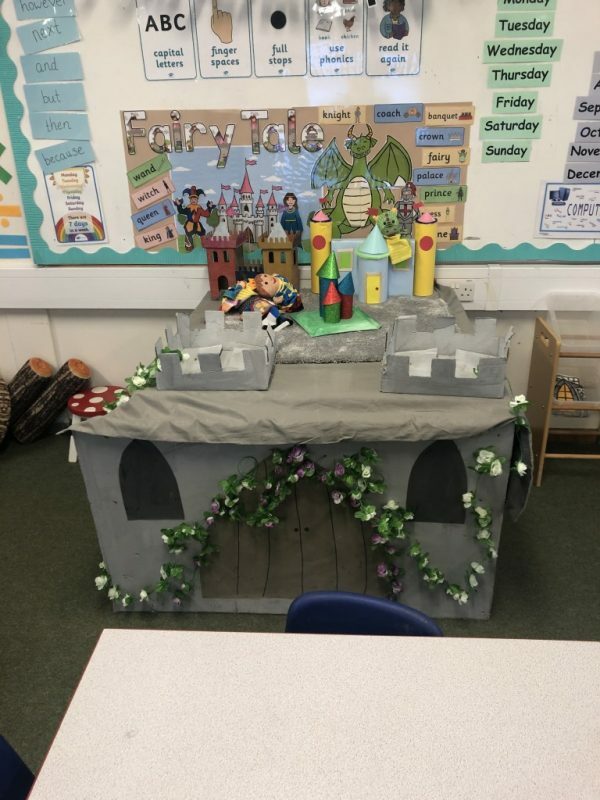 We will aim to incorporate the Castle theme into their non-fiction writing to give purpose to their work. In Maths, the children are continuing to develop their fluency in number. They will start to become more familiar with number bonds to 20, looking at place value of number. The children will begin to explore fractions and gain an understanding of whole, half and a quarter. The children will continue to recall the 2, 5 and 10 times tables. Later on in the term they will be investigating weight. In Science, we will be looking at materials and thinking about the best materials for building a sturdy castle and also applying our new knowledge of materials to our DT project, making a battering ram! History is focused on castles and life within the castle walls many years ago. We will be exploring who lived there, what they did and how they protected their home. Geography links with our history topic and we will be looking at different castles around the UK finding out why they were built where they were! In Computing we will be discovering programming. Children will explore computing devices, including e-safety awareness and more complex computing skills designing algorithms. In Art we will be developing our drawing techniques by creating castle sketches. This will help us to develop good observational skills and we will try to create images which are true to life, thinking carefully about the tones needed to achieve this. Music is all about Drumming this term and we will be learning how to keep a beat and create rhythm. We will also be continuing to spend time in our Forest school this year. Both year 1 classes will alternate each week spending their Monday afternoons down in Forest school making outdoor connections to our theme. Welcome to Year 1 with Mr Barnes and Miss Scott. During this coming Autumn Term our theme will be ‘All About Me’. This is a great topic to start the year with as it gives the children a great chance to settle into their new routine whilst getting to know about each other through their learning. In Literacy, we begin our topic by looking at lots of poetry focusing on our senses and learning how to use these to develop our descriptive vocabulary. The children will be encouraged to use all of their senses to describe the world around them. Following poetry, we will be exploring texts which contain predicatble phrasing. Our key text we will be exploring in relation to this is ‘Funny Bones’. Finally, the children will master th art in learning how to write captions and labels to secure their non-fiction skills and we will aim to apply these across the curriculum by putting labels and captions into our science and theme work too! In Maths, the children begin by developing their fluency in number. They will explore the number system and place value, learning to count, read and write numbers consecutivelly and in multiples and also identify 1 more and 1 less. They will also begin to use mathematical symbols within number sentences solving problems through all four operations. In addition they will be learning about different measurements and shapes. In Science, we will be looking at our bodies, including our external appearance, internal organs and our skeleton. We will be talking about the uses of each part of our body and why each part is important. In History we will be looking at our own history and the history of our local area. We will looking at how we have changed and the area we live in has changed over time comparing it to how it used to be many years ago. In Geography we will be getting to know our school and our local area. We will be developing our map skills by locating familiar places in our locality and learning how to draw maps of our own. In PE we will be undertaking the skills needed to perform gymnastics. We will be learning how to use the gym equipement safely and exploring the different balances and routines which can be performed on and around them. In DT, we will talk about eating healthy, whereby the children will have the opportunity to design, make and evaluate a fruit salad, whilst learning about the different types of food. In Computing we will be discovering programming. Children will explore computing devices, including e-safety awareness and simple computer use such as logging on and saving work. In Art we will be developing our drawing and painting techniques by creating self portaits. This will help us to develop good observational skills to and we will try to create portraits which are true to life, thinking carefully about the colours and tones needed to achieve this. In music, we will be exploring music through drumming. We will also be continueing to spend time in our Forest school this year. Both year 1 classes will alternate each week spending their Tuesday afternoons down in Forest school making outdoor connections to our theme.